The Bahamas: a string of pearls in the blue ocean. 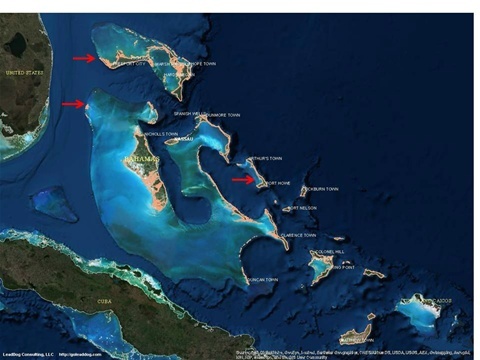 The Bahamas are a chain of hundreds of islands in the North Western Atlantic consisting of atols and cays: heaps of loose sediment piled up by the Ocean streams. The islands lie on top of shallow limestone platforms -or Banks, that rarely go deeper than 25 meter (see picture*: arrows show the three major shark locations from North to South: Tiger Beach, Bimini and Cat island). The Banks were presumably still exposed to air in the Ice age, but then gradually submerged below the rising sea level. Florida belonged to the same limesone formation, but remained above the rising sea level. The Bahamas were discovered by Columbus in 1492. Probably Cat island was his first stop on his way to the New World which was then baptized as San Salvador. In his diary Columbus described the Lucayans as the first inhabitants. They were related to the Tainos, indigenous people that inhabited most of the Caribbean islands, and who probably descended from of Indian tribes from the Amazone territory. One believes that the Tainos sailed from the Carribean islands to the Bahamas in the 11th century. The Spanish started capturing Lucayans as slaves in the decades following Columbus' arrival. Most of them were deported from the Bahamas to Spain. Much later, in 1718 the Bahamas became a British Crown Colony. The British invaders brought their own African slaves with them and established plantations on land grants. Today nearly 90% of the population descend from the slavery years of that early period. The nutrient-rich currents of the Atlantic Ocean and the gulf stream make the Bahamas the ideal haven for a variety of large predators: tiger, lemon, bull, carribean reef, nurse and great hammerhead sharks. The reefs at the edge of the gulfstream in the western Bahamas are often covered in corals and sponges and teaming with schools of jacks, snappers, grunts, countless tropical fish. They are one of the best places for meeting sharks, turtles, rays, and wild dolphins. Bimini, the most western island at the edge of the gulfstream combines two habitats: mangrove forests in the north providing a safe, shallow ecosystem for juvenile -mostly lemon- sharks, and the gulf stream-fed reefs and sandy shallows in the west to give them a rich and healthy environment to live in as adults. The Great hammerhead and Bull shark belong to Bimini's regular visitors. Bimini is also a favorite spot for anglers from the US who in the tradition of Ernest Hemingway go after the tuna, merlin and dolphin fish. Cat Island, at the east side of the Banks, at the edge of the Atlantic has recently become a sanctuary of the Oceanic white tip shark. This legendary pelagic shark can be visited while the dive boat is drifting in the clear deep and blue water of the Atlantic in the southern part of the island.